Why not have some friends over for a sleepover to brighten up those cold January days? Toys representing the characters from Miffy’s TV show are now in Debenhams. Throughout January, you can watch Miffy’s Adventures: Big and Small from 12pm every weekend on Tiny Pop. If you’re starting a new school year, it’s important to make sure you’ve got all the things you need beforehand! 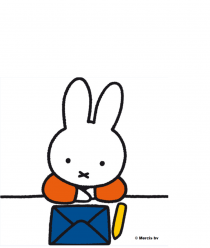 Miffy loves going on holiday with her family and exploring the world around her!